Mini Meatballs tucked inside bread cups made with Rhodes Frozen Dinner rolls, topped with pizza sauce and shredded Italian cheese. Who doesn't love a good meatball recipe? Meatballs are pretty popular in our house and I love using them as a starting point in so many recipes, especially for appetizers and snacks. These Mini Meatball Cups are so delicious and super simple to make. They're the perfect appetizer, snack or grab and go lunch. 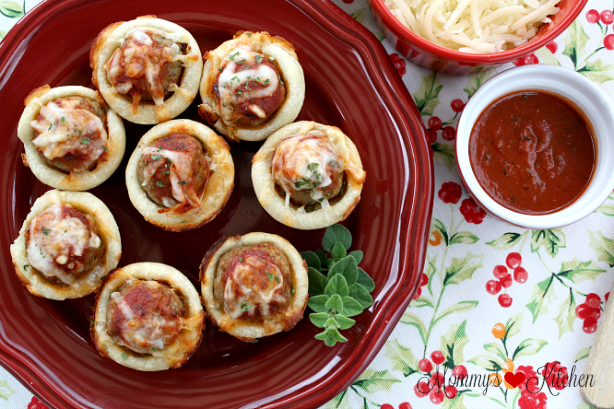 To make these easy meatball cups I used my favorite Rhodes Frozen Dinner Rolls, pre- cooked frozen meatballs, pizza sauce and cheese. The best part about this recipe is you don't even have to let the dough rise. Just thaw, shape the cups, fill with meatballs, sauce and cheese and then bake. 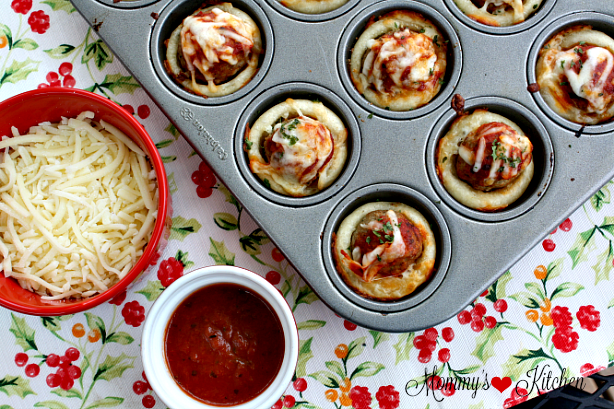 My kids love these little meatball cups and they're also delicious reheated the next day. Another delicious flavor variation is Mini Barbecue Meatball Cups using, meatballs, barbecue sauce and cheddar-jack cheese. This is a #sponsored post on written by me on behalf of Rhodes Bread! I'm a contributing blogger on Rhodes "Out of the Oven Blog" & "Rhodes Kids Baking Blog". I've been compensated for my time and efforts in creating this post. All opinions are my own. Oh my goodness. This is such a cute and creative recipe. I like that you used meatballs because my husband likes to make a few batches and freeze them. I'll have him make me a few mini meatballs next time. Rhodes rolls are a family favorite! Love this idea. We are huge meatball fans in this house. I make quite the variation of recipes using them. I have done sweet and sour, Tangy, Spaghetti and meatballs, meatball subs... NOW I am going to HAVE to try this. It looks spectacular. Now this is our kind of family dinner meal! My kids LOVE meatballs and I am sick of the traditional meatball sandwiches so I am excited to try this recipe. I know it will be a hit and it looks super easy to make! Thes are so much fun! Traditionally I think of meatballs paired with spaghetti, but instead it's almost a mini meatball pizza of sorts. I bet these would make a great snack for kids after school. We host a monthly Spaghetti dinner party and i know what I'll be making with our left over meatballs. Thanks (as always) for another great recipe! This looks so fun! As a Mom with a team full of picky eaters recipes like these are perfect solutions. Healthy but fun at the same time . . . I never have the idea of making meatballs. Tonight I actually do have all the ingredients for this. I could potentially make it. Love how easy and tasty and compact these are. It would be a very big hit here I am sure. 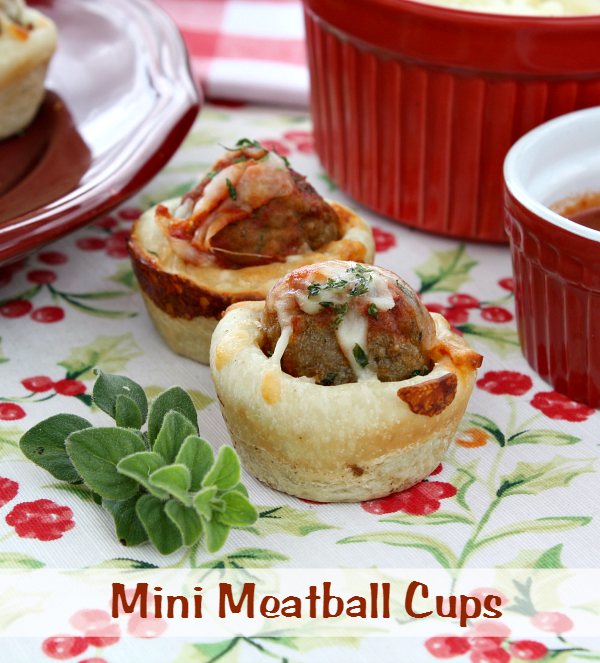 Tina, these mini meatball cups are amazing! I like pigs in a blanket but am tired of them. This recipe will be a winner with my whole family! Pinned and yummed and retweeted :) Hey, I host Wonderful Wednesday Blog Hop on Ducks 'n a Row every week. We open Tues eves 7pm ET and go through Saturday. Please stop by! These are so amazing! Such a great idea! Thanks for sharing!